Well, it seems like yet again, an asteroid the size of a country is hurtling its way through space, earth is poised on the brink of utter annihilation, and humanity's last hope is a rag-tag bunch of misfits with a nuclear weapon strapped inside a metal coffin with 270,000 parts made by the lowest bidder. This is not their story. Instead it's the story of a Ground Control operator, brought back from retirement for one final job: pressing all the right buttons so those other guys can save humanity. You've screwed this up in the past, but now, you've been given A Second Chance. A Second Chance is a humorous space simulation by Major Bueno developed in 24 hours as part of his One Game A Month project. The basic goal of your mission is to get the astronauts to the asteroid, drill a hole in it, plant the bomb, get them out of there, then detonate the bomb. In front of you are dozens of buttons that need to be clicked in the proper order to complete your task, as well as quite a few that serve no purpose. Press the wrong button, and man, the fail will be epic. It's the kind of concept that probably couldn't be maintained in a larger game, but, as it stands, each playthrough of A Second Chance is just long enough to mean that your screw-ups end up being hilarious rather than frustrating. ("Ah yes. I suppose I should have closed the doors of the shuttle before taking off from the asteroid. Yes, that would make sense. Sorry about that, guys.") There are a ton of little easter egg clickables and subtle jokes that make it all-in-all a sweet little minigame. This is ground control to Major Bueno: when it comes to A Second Chance, you've really made the grade! A Second Chance Walkthrough now available! 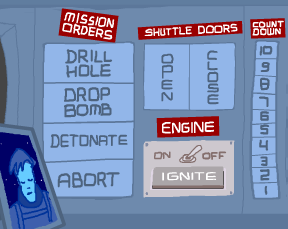 3) Switch Engine to "On"
I just made a perfect run, no mistakes, mission successful, everyone lives. ...Do you think I missed the point? I love their faces when you do something ridiculous. Do you have to play with sound up? Be sure to click on the photo in the frame a few times. I'm not sure if this is a game, winning is so easy, but it's definitely fun! The narrator is great. I just wish there was some more dialogue-reward for different endings, my instinct for multiple ending games is making me do it but I'm not getting any response. I've already killed the crew and the whole planet in several ways. This game seems to have been begging for a legitimate use for all of the extraneous functions. And it's easy to imagine the sorts of complications that would require some of the sorts of prepared responses that our prodigal supervisor has in store. But of course, I, too, may be missing the point. Straightforward & linear to the point of being rather boring. Except for when you click on the picture frame, I don't feel that wackiness we've come to know & love from MajorBueno. Bugged Game. The Drill and Drop Bomb actions are independent of the crews location, meaning you can beat the game while leaving the Crew and Bomb on earth. ...or you can just leave the crew on the moon and have them blast the asteroid, and everyone would be happy. This is the funniest game I've seen in quite some time. Like, tears-running-down-my-face-since-I'm-laughing-so-hard funny. Oh come on, this game doesn't need a walkthrough, unless you're an 8 year old. The game is basically the movie Armageddon without Aerosmith or any of the fun. Sent the shuttle with the guys on it to the asteroid. Opened the doors before it landed and sent two of them (one of whom had the bomb) careening off into space. Had the other two leave the ship and drill the hole. Had them try to enter the ship and for no apparent reason go careening off into space. Cute game. For whatever reason the time/s (I forget) I lost were before I even got to space. The best part of this game is finding out how many different ways to fail there is... and doing them ALL! *laughing till crying* I managed to tear the Earth in half. Well, at least half the people lived! Close the doors. Make the astronauts walk to the closed doors. Open the doors. Open the doors in space (as mentioned by Tenzhi). Ignite without turning on the engines. Detonate the bomb right before the space shuttle lands on the asteroid. A different ending:Explode the bomb immediately after drilling a hole on the asteroid without rescuing the astronauts. Glitch: Open and close doors rapidly while the space shuttle is flying. The astronauts will already be on the asteroid.